Thorold, Ontario: Landlord Web Solutions (LWS) is pleased to announce that they are the 2017 recipients of the Technological Entrepreneur Award, at the 24th Annual Niagara Entrepreneur of the Year Awards. 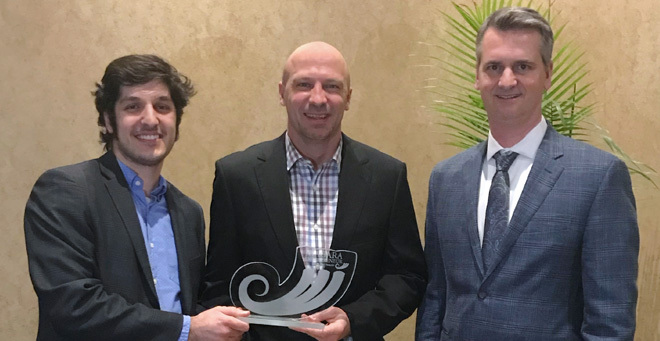 "Niagara is a great place to grow a technology based business and we're proud to be recognized as a leader in the local industry," says David Koski, co-founder of LWS, "We have been able to reach clients across Canada and the US at our level of success, by tapping into the talent and opportunities that the Niagara Region has to offer." Co-founders, Michael Mottola, Jason Leonard and David Koski were presented the award on the evening of February 23rd, amidst their fellow nominees and winners. "While David, Michael and myself were the ones recognized, this was really made possible by the team we have and in reality, each and every one of us are winners of this award," says Jason Leonard, co-founder of LWS, "In addition, we'd like to thank Venture Niagara and BDC for their support over the years - this is a win for them as well." About LWS: Landlord Web Solutions (LWS) a Canadian-based, niche focused website design and online marketing company that caters exclusively to the rental industry in North America. Co-founded by Jason Leonard and David Koski in 2010, LWS has quickly become a leader and trusted supplier in the rental industry. Over the past number of years, LWS has built outstanding websites for many of the largest property management firms in Canada and the US.